Oscar Pistorius has admitted he does not fancy his chances of winning one of the most highly-anticipated races of the London 2012 Paralympic Games. The Blade Runner's showdown with British sprinterJonnie Peacock in the T44 100m final next Thursday night will be a highlight of the Games. 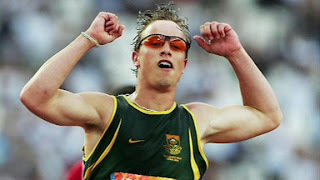 The South African is the defending champion, but has more recently focused on qualifying for the Olympic Games over 400m. Only last week the 25-year-old raced for the first time over 100m in 16 months. ‘I think it's important to note I haven't run a 100m personal best in five years,’ said Pistorius, who will also race in the 200m, 400m and 4x100m Relay. ‘It's not really my event so, although I do feel threatened, I don't feel helpless. As Jonnie and those guys focus on the 100m, my focus is on the 400m, on the opposite side of the spectrum when it comes to sprinting. ‘If I can just get in the top three I think I'd be very happy. Pistorius, who will carry the South African flag for the first time at tomorrow's opening ceremony, revealed he had lost 11 kilograms since Beijing 2008, but had spent the last three weeks in the gym to bulk up as much as possible for the shorter sprints. Nineteen-year-old Peacock broke the 100m world record with a run of 10.85 seconds in June and Pistorius admitted his progress has taken him by surprise. But there are also the likes of American Jerome Singleton, who beat Pistorius at the 2011 IPC World Championships to worry about, as well as a rival more closer to home - his room-mate Arnu Fourie. The first round of the men’s T44 100m takes place on Wednesday 5 September.